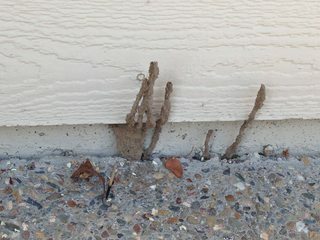 Are these brown finger-like things on the outside of my house caused by termites? Is this ground termite? This is on the outside of a wall in the backyard. This is the only occurrence of this thing. Should I be worried? Should I call someone to look at it? OR can I fix this myself? Those are definitely termite tubes. Those are the exploratory tubes that termites make when they come out of the soil and are exposed to air and light. They build the tubes out of dirt and their feces to protect them when out of the ground. Definitely termite tunnels. These are common on the side of a house, or inside a crawl space going up foundation walls. Not the answer you're looking for? Browse other questions tagged exterior pest-control termite or ask your own question. Do termites stay in the wall? are these mud tunnels from termites or carpenter ants? Will I get more pests/insects if my neighbor sprays and I don't? Uh oh. I've just noticed flying termites around my new outdoor office. What is a cost-efficient way to protect it? Does this look like a termite? Is it safe to inject termite foam into the wall around water lines/plumbing? Is this a wood destroying insect?